Way way back, at the start of this blog I talked about how I store my patterns. Since I tend to trace my pattern pieces instead of cutting into the original tissue, I wind up with far more pieces than fit into the original envelope, so I use big mailing envelopes. They work perfectly for large numbers of pattern pieces, enlargements from sewing books and patterns I find online, but I had a lot of these big envelopes floating around, so I needed to figure out a storage system. 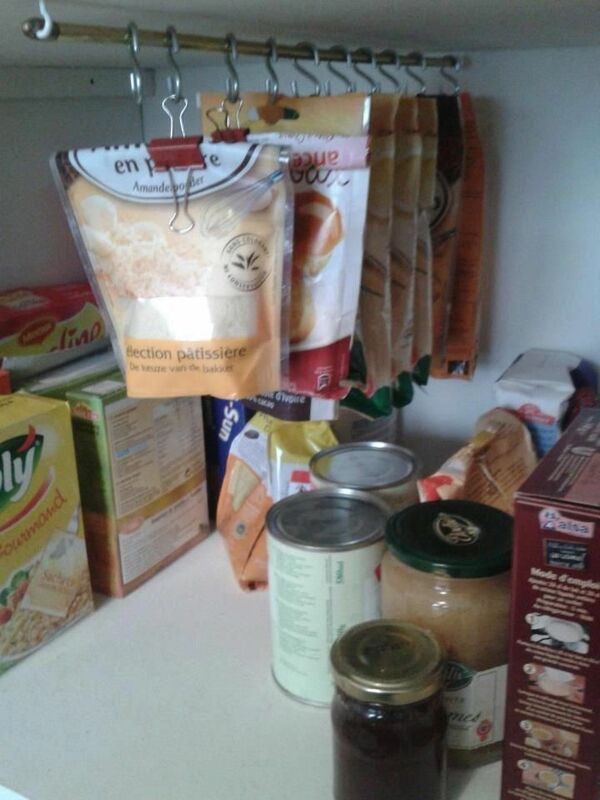 One night I was messing around on Pinterest and came across this pin for storing gravy and soup mix packets in your pantry and a light bulb went off. I knew applying the same principal to my pattern envelopes would make them easy to flip through, but keep them out of the way, so I drew up my plans and tucked my supply list into the Mr.’s pocket as he headed to the hardware store. Wow that looks crooked in that picture…it’s not, I assure you. My original design used triangular supports made of wood with a hole drilled through them for the dowel, but my husband found shelf brackets that had a decorative curl on them that the dowel fit into and (correctly) assumed that I’d appreciate another shelf to put my stuff on. I started by hanging my patterns on curtain rings with clips attached to them, but very quickly ran out and switched to book rings with binder clips…a solution that I actually prefer. The curtain rings are prettier, but the book rings give me a lot more flexibility to add and reorder my hooks. To put more curtain rings on (or take them off) I have to twist the dowel out…which is really difficult, so clipping book rings around it while it stays in place is a much easier way to go! My office is still kind of a wreck. I’m still trying to fit about 15 different hobbies into a space that is suited to 2, maybe 3 tops, but slowly, bit by bit it’s getting there. At least it doesn’t look like this anymore! Visit Erin the Creative Broad's profile on Pinterest.